Does China Really Want to Lead the World Order? Despite the alarmist rhetoric we have seen, it is far from clear that this is the case. China clearly never bought into these underlying deeper principles, something that it has shown relentlessly in its response to Western criticisms on human rights and political reform over the last decades. The United States and others may have assumed that engaging China with the international system would be a means for incremental change in the People’s Republic, so that it would slowly become more like us. In fact, as we see in 2016, things have not quite turned out according to plan. We have a hybrid China, which has engaged economically on globally accepted rules and procedures, but also has clearly maintained its own specific system domestically, one where multi-party democracy, rights, and freedom of speech, have never looked more circumscribed and remote from Western expectations. We can now be pretty confident that China engaged in the rules-based external order on a very pragmatic basis. It was never about belief, or convictions, or subscribing to anything in terms of faiths or ideals. China’s compliance was all about the country, since Deng in the late 1970s, having accepted that the material outcomes of the Western system then were better and more impressive than those produced under Maoist-style socialism within China. It was the classic case, in this area at least, of a leadership saying that if you couldn’t beat someone, you might as well join them. And join in China did, with evidently great success. It paid lip service to the international rules-based order, using it dexterously for its own ends and churning out tangible achievements. Where there were rules that were useful to China, it observed them. And on the whole, in most areas, the predictability given by rules and regulations meant that China did see value in conforming. All of this culminated in China’s entry to the World Trade Organization in 2001, the moment when Beijing most intimately accepted external regulations and the need to abide by them – but, though this was never overtly stated at the time, very much on its own terms. In 2016, China maintains this pragmatic attitude toward rules and regulations. It does not regard them as points on the pathway to acceptance of Western values and the underpinning belief system. They are simply pragmatic tools, with a utility and functional use. For China, the end objective is elsewhere. Where that elsewhere might be has always been a mystery. For some it has been pointing toward a heady populist religion of great nation statehood. For others it has been an attempt to export the China meritocratic model – an idea, however, that seems to have had limited traction within China. For others, it has been the realization by China of some neo- Confucianist global order where China at least has its status appreciated. But evidence has been thin that there is, in fact, some grand Chinese meta-narrative it wants other to buy into – a competing values system to vie with, and then overcome, that of the United States and the West. The Chinese approach has always been pragmatic, led by utility – that’s about it. The end result is a vision where China is accepted and understood on its own terms, and the rest of the world accepts that and leaves it as it is. Where is the connection with the new Trump order about to be unleashed on the world? Simply that, as never before, it is likely that space is going to open up around China, and areas of influence become available to it, as a more protectionist, isolationist mentality starts to dominate in Washington. What this will do is to push China as never before to take a stand, as it already has had to, on climate change, security, and other issues where Trump seems ready to roll back and let others do the work. If China starts to articulate a counterpoint set of values and norms, then we can see a moment of real exposure, when we will know what greater ambitions it has been harboring over the last few decades. But the likelihood is that China will continue to embrace utility and functional outcomes, simply maintaining rules because they make life easier rather than because of any ultimate belief system propping them up. That is the point when we will know that modern China is the ultimate utilitarian power, and that all the fears of a China-centric vision about to overwhelm the rest of the world were simply phantoms dreamed up outside of China and never subscribed to within it. 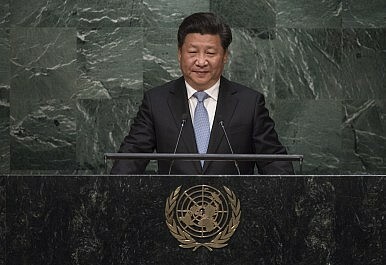 China is revamping its human resource deployment to organizations like the UN.